The Lakeside Daisy is a tough little flower that only grows in 4 known locations in the United States. One of those locations is in the old quarries found on the Marblehead Peninsula. In 1988, Ohio's Division of Natural Areas and Preserves acquired 19 acres of an abandoned limestone quarry where the Lakeside Daisy grows. Thanks to the efforts of Ruth Fiscus and Collen Taylor, that area where the Lakeside Daisy grows is now protected. The long-lived perennial grows where few other plants can survive, and when you see this preserve, you'll appreciate how really difficult those growing conditions can be. 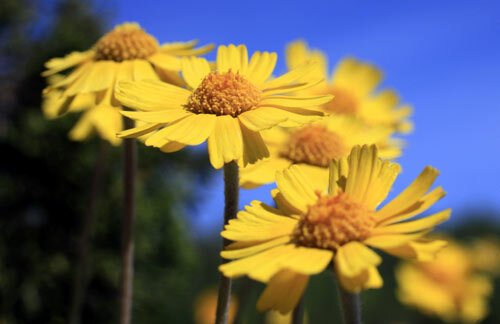 In early May, the preserve is awash in yellow blooms that will continue through to early June. The preserve is only open during the month of May for visitors to protect the habitat of the Lakeside Daisy. Besides growing on the rocky Marblehead Peninsula, the Lakeside Daisy also can be found on the Bruce Peninsula and Manitoulin Island both in Ontario, Canada, as well as the Upper Peninsula of Michigan.